Although the concept of a hybrid cloud strategy isn’t anything new, it still has an air of confusion about it. From an accurate and comprehensible definition to real, quantifiable benefits, some companies remain skeptical. So in today’s blog, we’re exploring the hybrid cloud solution and some of the key benefits it brings to the table. There have been quite a few variations of the hybrid cloud definition however, a key component has remained relatively consistent. It is the combination of a public cloud and private cloud or IT infrastructure supported by a single provider. These two infrastructures then operate independently from one another and employ a technology that supports data and application portability by communicating through encrypted connections. Companies are then able to deploy the applications that require said data in leveraging the computational resources of the public cloud while storing privileged data on the private cloud. A primary advantage of a hybrid cloud strategy is that it gives IT decision makers more control over the public and private components in comparison to a standard public cloud only platform. When it comes to the hardware selection and system design, a hybrid model allows IT departments to customize the private end to effectively meet their needs. Another benefit of a hybrid cloud strategy comes in the form of cost savings. Users only pay for additional compute time when they need it making it a cheaper solution for companies that only have certain times during the year where a larger amount of compute time is required. The option of building out their public cloud costs infinitely less than if they were to do so on the private end, especially as it would sit idle for extended periods of time. 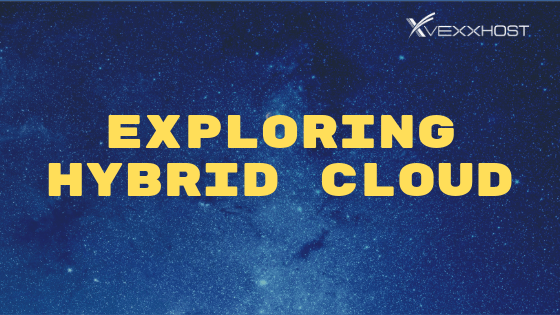 Hybrid clouds also have the advantage of reduced access time and latency due to the fact that the private end is easily accessible and doesn’t require the use of the public internet. Additionally, building out the private cloud within a hybrid strategy also enables a more flexible server design, giving businesses the ability to supply rapid and archival storage at a lower cost. When combined with the numerous options of new SSDs and helium-filled hard-drives, companies no longer need back-up tapes for their data storage which can appeal to those with a particulra focus on security. All in all, a hybrid cloud strategy simply gives companies more choice. Be it in terms of the type of cloud, the hardware, the design or their costs, a hybrid cloud provides organizations with both freedom and control. While running Canada’s largest OpenStack public cloud, VEXXHOST also offers a private cloud platform that takes freedom of choice and customization to another level, enabling users to have bare metal, virtual machines and containers all within the same environment. For more information on how you can harness the best of both public and private cloud with VEXXHOST, visit our hybrid cloud page, or contact us!